Clause (2) of Article 276. It is a state-level tax. It is also a source of revenue for the State Governments which helps the different state in implementing schemes for the welfare and development of the region. Tax can be paid Monthly, Semi-Annually or Annually. It also consists of Rate-slabs (mentioned below) which are based on the total income of the professionals. Lawyers etc or carry out some form of business. Any person who is suffering from a permanent physical disability (including blindness). Persons of age 65 years and above (60 years in a case of Karnataka). In the case of salaried professionals and wage earners, the tax is deducted from the employee salaries. Employers have to pay tax on behalf of their workmen/employees to the State Government. Owner also has to file a return with proof of tax payment within the specified time. The employer must apply for the registration within 30 days of the appointment of staff in the business. If the office is in more than 2 states, then different applications need to be sent to the relevant authorities under different states. A copy of PAN Card of your company. A copy of Memorandum Of Association (MOA) and Article Of Association (AOA). Identity and Address Proof of Directors/Partners. A copy of Resolution of Board of Directors. Address proof/Rental agreement of registered office/ warehouse. Electricity/Maintenance Bill of registered office/factory/warehouse. Canceled cheque from Company’s bank account. All these documents, registration application, and fees submitted to the State’s Tax department. After verification, officer issues a registration certificate and your Professional Tax Registration is successful. Case 1: If an employer has more than 20 employees, then make payment within 15 days from the end of the month. Case 2: if an employer has less than 20 employees, then make payment quarterly (i.e. by the 15th of next monthfrom the end of the quarter). Case 1: Professional Tax Certification Number is not with the employer then the employer will incur a penalty of Rs.5/- per day. Case 2: No/late payment, the employer will incur the penalty of 10% of the tax amount. Case 3: Late filing of returns, a penalty of Rs. 300/- per return is chargeable. Andhra Pradesh, Assam, Bihar, Chhattisgarh, Gujarat, Karnataka, Kerala, Madhya Pradesh, Maharashtra , West Bengal, Orissa, Tamil Nadu are states which impose professional tax. States: Arunachal Pradesh, Chandigarh, Delhi, Haryana, Himachal Pradesh, Nagaland, Punjab, Rajasthan, Uttaranchal, Uttar Pradesh. Union Territories: Andaman & Nicobar, Dadra & Nagar Havelli, Daman & Dui, Lakshadweep. Sikkim: Professional Tax levied on Business Houses. 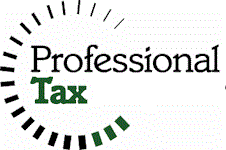 Professional tax is a tax levied by the State Government. All states do not impose this tax, only some of them collects tax.This tax is a source of revenue for the states who imposes it.